If you suffer from anxiety and experience racing, panicky thoughts, you need help right away. You've probably heard about mindfulness, and how effective it can be in easing anxiety and worry--but how do you do it, exactly? In this go-to guide, psychologist Scott Symington presents a practical, breakthrough approach called the two-screen method to help when painful thoughts feel overwhelming. Using this simplified mindfulness approach, you'll learn to accept and redirect your thoughts and focus on your values. 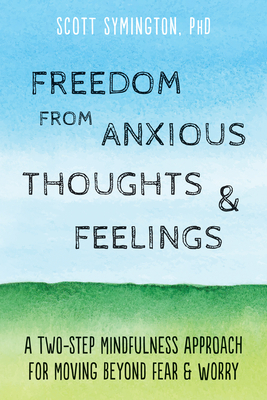 By using the two-screen method outlined in this book, as well as the three anchors--mindfulness skills, healthy distractions, and loving action--you'll learn to relate to your thoughts and feelings in a whole new way. And when threats, fears, insecurities, and potentially destructive thoughts and feelings show up, you'll have a game plan for dealing with these difficult emotions so you can get back to living your life. If you have anxiety, being present with your negative thoughts is probably the last thing you want to do. That's why the two-screen method in this book is so helpful--it offers a way to diffuse from your anxious thoughts while still focusing on the things that really matter to you. Scott Symington, PhD, is a clinical psychologist who is dedicated to helping adults overcome worry and anxiety, negative moods, addictive behaviors, and other conditions stealing people's joy and freedom. In addition to a full-time private practice, he regularly speaks at professional conferences; large church groups; graduate schools and universities; and business groups, including the Young Presidents' Organization (YPO). Symington earned a PhD in clinical psychology from the Fuller Graduate School of Psychology, and completed an MA in theology from Fuller Theological Seminary. His career path began in the business and consulting world. Then in 1998, after much soul searching, he decided to leave a lucrative position brokering agricultural products to pursue his true passion: clinical psychology--a profession that lined up with both his head and heart. One of his primary interests, which is informed by his diverse experiences and training, is making the evidenced-based methods of psychology and spiritual wisdom easy to understand and easy to apply to your daily life. Symington practices and resides in Pasadena, CA.